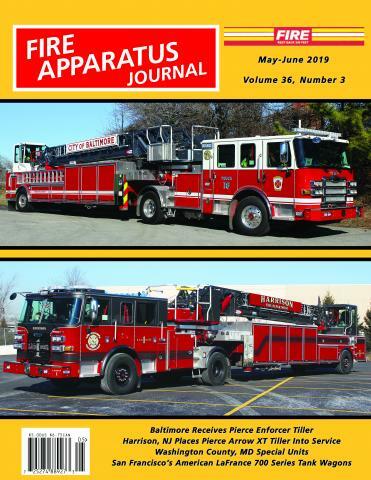 Philadelphia by Jack Wright | Fire Apparatus Journal Inc. The Philadelphia Fire Department protects an area of 139 square miles with a population of 1.5 million. The Department consists of 2300 personnel staffing 2 divisions, 11 battalions, 61 engine companies, 29 ladder companies, and 50 medic units. There are also numerous special units that include a heavy rescue and collapse unit, a haz mat unit, two air supply units, two fireboats, and an airport crash unit. This column reports on new deliveries, rebuilds, conversions, reassignments, new orders, and anything else that relates to the PFD apparatus fleet. Philadelphia operates an interesting fleet of apparatus from several different manufacturers which is constantly being upgraded. The Philadelphia Update is written by Jack Wright, a lifelong resident of Philadelphia who developed a fascination with the fire service at an early age. Family vacations usually included a trip to the local firehouse so that he could get a look at the local apparatus. As he grew older, Jack began to collect fire service books and photos, eventually borrowing his father’s camera to shoot his own photos. As Jack’s interest in Philadelphia Fire Department history grew, he became a volunteer apprentice under Jack Robrecht, the department historian, at the Fireman’s Hall Museum. Jack Robrecht refined Jack’s photography skills and shared much accumulated historical information with him. Much of this historical information was used to write Hike Out, the only comprehensive history of the Philadelphia Fire Department to ever be published. The book was co-authored by Jack Wright and several other members of the historical committee. In October 2007 Jack was named official fire department historian by the Fire Commissioner. He continues to document the history of the department and give photographic presentations to groups interested in the history of the Philadelphia Fire Department. Jack Wright may be contacted at jpw25pfd@aol.com.